This past weekend was nice and action-packed, lol. 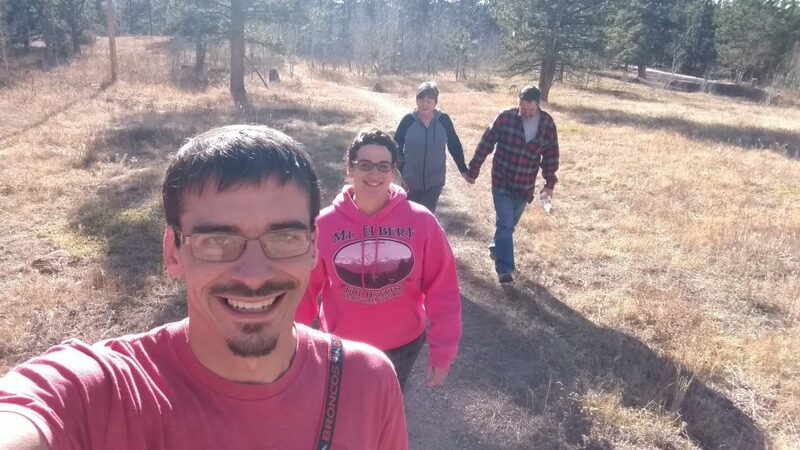 We started the weekend off with Camping at Jack’s Gulch, in Poudre Canyon, with Uncle Scott and Aunt April. It was the last weekend that this campground was open for the season. They will reopen next year on May 26th. 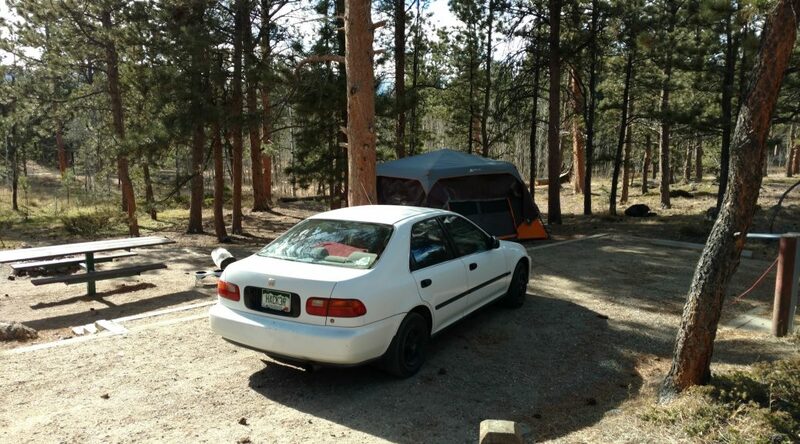 “Jacks Gulch Campground is located adjacent to the Pingree Park Road (CR63E) and the Old Flowers Road. It is situated in a ponderosa pine forest setting with scattered clones of aspen. It is also an area that has abundant wild flowers at certain times of the camping season. The Columbine Loop has 27 sites with electrical hookups. This loop also provides access to 10 walk-in tent sites. The Yarrow Loop has 28 sites without electricity. A unique feature of this campground is an equestrian camp which has 5 sites, each with four horse stalls and room to accommodate a horse trailer. Each site contains a tent pad, fire grate, and picnic table. There is a hiking trail that circumnavigates the campground. A portion of this trail serves as a self-guided nature hike and offers a stunning view of the Mummy Range. Popular activities in this area include hiking, stream fishing, mountain biking, scenic driving and some four-wheel driving.” Josh and I camped in our tent, as we normally do, but this time we had Keeda in the tent with us, so we had to make sure she was warm as well. We purchased a small space heater from the store on our way in. Since we were going to be camping at an electric site, we figured it would work out perfectly. When we first arrived Friday night, we began to set up our tent while we waited for the remainder of our party to arrive. We laid down one tarp under the tent, one inside the tent, and one we draped over the tent, in order to maintain a warmer temperature inside. We brought an inflatable bed this time in order to have that extra layer between us and the cold ground. After setting up the airbed and the sleeping bags, I had to set up Keeda’s sleeping area. We brought her orthopedic bed and a bunch of blankets. 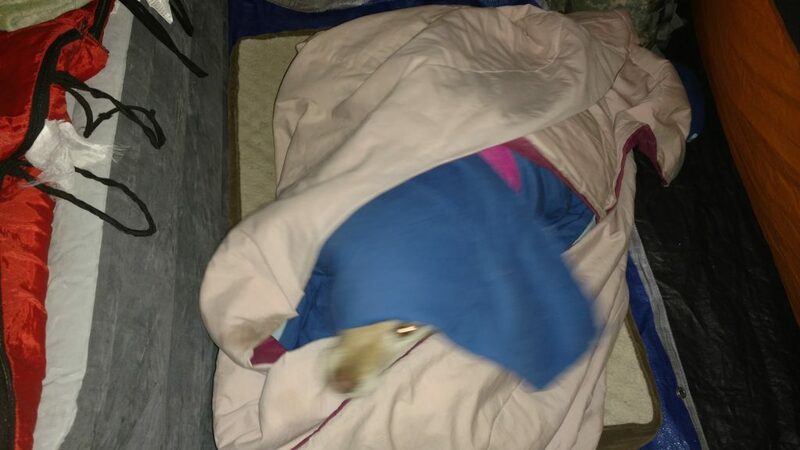 I laid the blankets down in a way that I can simply wrap her up in them like a little cocoon in order to keep her warm, in case the heater idea didn’t work out. Utilizing a carabiner, we hung the space heater from the ceiling of the tent and turned it on so that we can test it out and warm up the tent. This idea worked out PERFECTLY!! Once we were ready to go to bed, we removed it from above us and placed it on the ground at the corner of the tent. The space heater had a tip switch that would turn the heater off instantly if it was tipped over by accident during the night. It was warm enough in the tent that I did not need my beanie or hoodie for the night; being in the sleeping bag was sufficient in order to be comfortably cozy and snugs. Saturday Night was a bit frosty and we were very thankful for the space heater… we woke up to a frozen windshield and a layer of frost on EVERYTHING. Sunday morning, we packed up everything, had breakfast, said our goodbyes, and headed back home to get ready for the rally. We had a full day planned for Sunday. 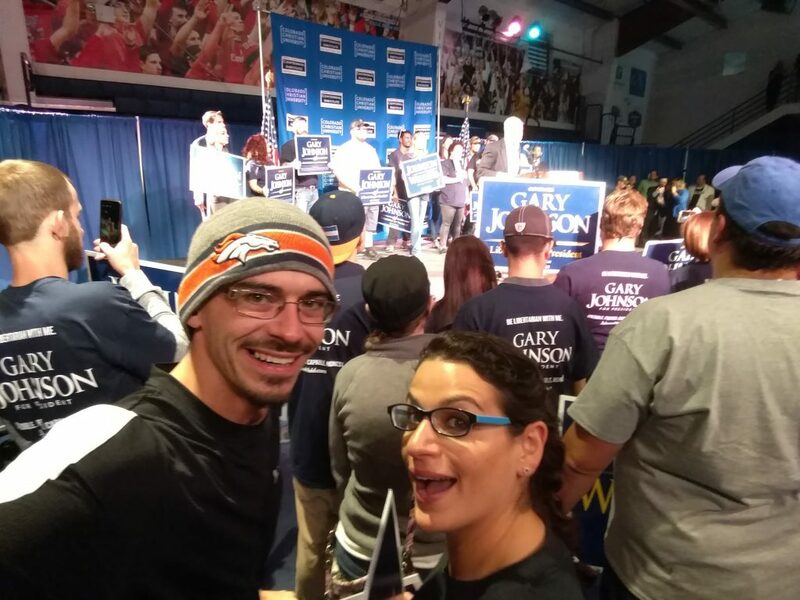 We had reserved two tickets for the Governor Gary Johnson Rally in Denver at 3:00PM and were super stoked about it. We got there early and watched the Liberty Comedy tour before heading over to where the Rally was going to begin. 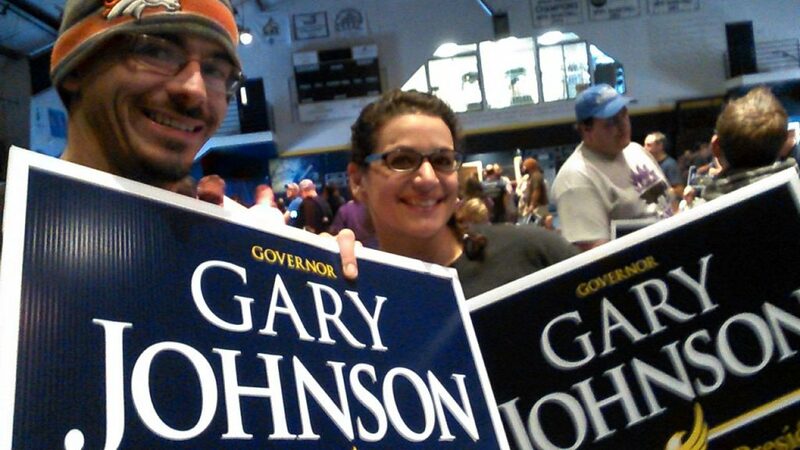 At the rally, we listened to several speakers before listening to Governor Gary Johnson. We are huge fans and were super happy to have been able to make it. We got to meet Governor Gary Johnson and chat with him for a moment before taking some selfies with him. It was incredible and we are looking forward to rallying again next election season. Since the Broncos were playing, we had to make sure to get to our destination by the time the game started. We hopped in the car, ran home to grab Keeda, and then headed out to watch the game. The game was a bit of a disappointment but hey… we all have our good days and our bad, right? After all is said and done, it was another successfully wonderful weekend! Here’s to another adventure next weekend! !